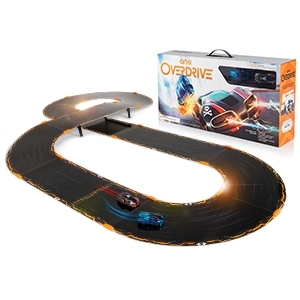 This is a car race game where two cars are provided along with the 12 track pieces (to build the tracks where the cars will run) when you purchase the Anki Overdrive starter kit. Out of 12 track pieces 6 are curved and 4 are straight and other two are above ground (raised) track pieces. Raised track pieces are meant to jump the cars from one track to another while in race. All the track pieces are flexible and durable and magnetic in nature at joints and so they can be very easily assembled without much efforts. One complete tracking route thus built using 12 or 10 (when two raised track pieces are avoided) different track pieces is known as the battlefield. A total of eight different battlefields can be created or recreated using 12 different Anki Overdrive track pieces. Instructions for building the 8 different battlefields are provided in the manual supplied along with the starter kit. There are different names given to these 8 battlefields like Loopback, Quadra, Microloop, Capsule, The Wedge etc. A charging system to charge 4 cars at a time is also provided. The starter kit however comes with only 2 cars named Skull and GroundShock but other Anki Drive cars like Thermo, Nuke, Big Bang and Guardian can also be purchased separately for added fun and more exciting features. Learn more about these other cars on official website Anki Inc. All these are robotic Supercars which are controlled by an app specifically made for it. The app can be downloaded free and it is compatible with your android and iOS devices. Its first important to download the app on your compatible mobile device and once the app is loaded click on "Get started". Now you just need to follow instructions one by one given in the app and that way you will be able to control your car on the battlefield. Make sure your bluetooth is in ON mode to connect app with the two cars. The starter kit will be provided with 2 cars, one of which will be controlled by you ,while the other is automated robotic car which is programmed to think independently while it is running on the tracks and doing a race or fight with your own car controlled by you. The automated car is being scanned while running on the track and that is how it understand the race and its competitor. Total 4 cars can be run on the battlefield at a time. You can control one car and set up 3 others into AI mode to race against you. You can also compete in the race with your friends or relatives or siblings if they also have the app installed and running on their android or iOS devices. But you will be instructed first to put the two cars on charge when you will start your app. Charging station is provided along with the Anki starter kit to charge at least 4 cars at a time. So this should not be a problem. Also the two cars provided have several features like defending, using weapons and controlling the speed. You will be aware of all the features once you start using the app to run the race. There are also different game modes to challenge your friends. Just watch this nice review video and you will better understand the functioning of this product. This is one of the best mobile app based car race playets in the world and so don't take this product lightly. Cars also have the built in rechargeable battery and so its easy to recharge using the charging station provided and no need to replace batteries with new ones. One can play with the game for 20 minutes for 8 min charge.